How nautical is the navy with the red?! OH my goodness. I love, love, love the navy one. The only thing that could make me love it more would be if the heart was an anchor. Thanks so much for sharing! 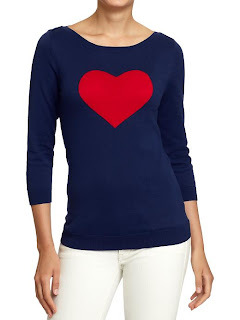 I've been dying that J.Crew heart sweater for ages, so I've gotta go pick up the Old Navy version. They look almost exactly the same! Thanks for posting this!!! I have been wanting one! Loving the red and navy! How precious! Love that red and navy! They're all so cute. I don't think I could choose a favourite!